A: "the assumed annual growth averages about 1.5% of current emissions, so the net greenhouse forcing increases exponentially"
B: "decreasing trace gas growth rates, such that the annual increase of the greenhouse climate forcing remains approximately constant at the present level"
C: drastic reduction in GH gas growth. See also appendix B with more assumptions on other GH gasses. CO2 emission trends continue to accelerate in 21st century . Yet this upper-limit projection predicted annual emissions growth of only 2.3 percent between 2000 and 2010far less than the 3.1 percent annual increase observed so far this century. So Hansen was too optimistic and he should also have included a scenario even higher than A. So if we compare nowadays reality we certainly can disregard scenario B and C.
No way of a A+ scenario. 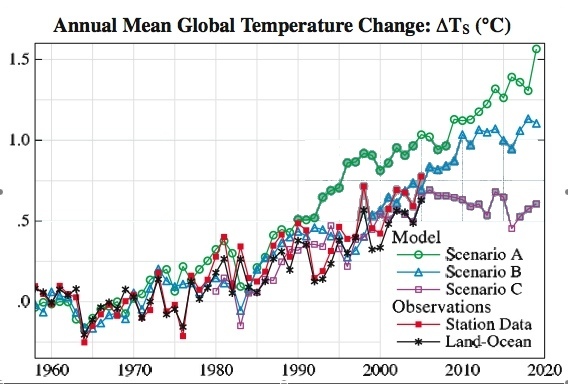 Who can possibly maintain that Hansens prediction was correct, implying that climate was mostly about greenhouse gasses and very little about anuything else. yes of course there is the solar variability and La Nina but there is also El Nino of 1998, (a nice end point bias of the IPCC). So what is really driving the climate? The CO2 or the sun and the ENSO? temperatures have been in stasis for almost a decade and may now even be falling. IPCC policy is already leading to economic and unintended environmental damage. Specifically the policy of burning food â€“ maize as biofuel â€“ has contributed to sharp rises in food prices which are causing great hardship in many countries and is also now leading to increased deforestation in Brazil, Malaysia, Indonesia, Togo, Cambodia, Nigeria, Burundi, Sri Lanka, Benin and Uganda for cultivation of crops .